Chicago Friday Night Flights Wraps its Second Season - See you in 2019! Chicago’s First Laver Cup A Rousing Success! Perhaps you have already heard but it bears repeating – I am incredibly pleased to share that for the second time in two years, Condé Nast Travelers’ readers have voted Chicago as the “best big city to visit in the U.S.” Last year was a first for Chicago and once again, the publication’s Reader’s Choice Awards voted the city to the top spot in its annual survey. 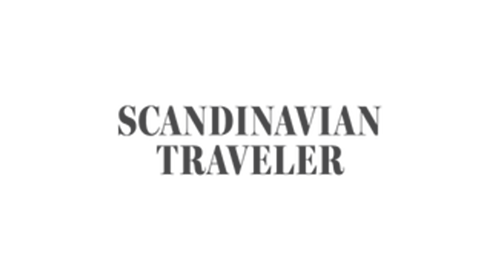 Condé Nast Traveler is a luxury and lifestyle travel magazine published by Condé Nast. The publication’s Reader’s Choice Awards are billed as the longest-running and most prestigious recognition of excellence in the travel industry and are commonly known as ‘the best of the best of travel.’ Over 470,000 votes were cast and Condé Nast Traveler itself was quite broad in promoting this prestigious ranking through its various print, digital and social media platforms reaching over 22 million travel enthusiast. Condé Nast Traveler&apos;s Reader&apos;s Choice Awards names Chicago as Best Big City To Visit in the U.S. It is always significant when a leading travel publication and its savvy and knowledgeable readers vote you the number one travel destination in the nation. But to be selected now for a second year in a row – this simply speaks volumes of the kind of city and destination Chicago has become, the kind of experiences discovered here and validation of the overall effort so many in our community are making every day to invite and welcome the world here. This is the kind of momentum that will help us shape our destination message with unabashed pride and confidence (while always being respectful and cognizant of headwinds and challenges). Each of you as partners, key stakeholders in our visitor and hospitality industry, entrepreneurs and providers of amazing travel and entertainment experiences should be incredibly proud of your city, our industry and this amazing recognition earned. Speaking of momentum, this month we are now able to report on key hotel performance indices year-to-date now through September. Room Demand (hotel rooms consumed) is pacing up 4.9% for the year. This is very important as our success in part continues to fuel hotel investment and supply which is now up another 3.4% for the year. Average Daily Rate is pacing up 5% as we help attract more cosmopolitan travelers (indicative as an example of Condé Nast Traveler readers) who are more conducive to staying in a hotel, staying longer in general and spending more based on their travel and experiential interests. As always, thank you for your ongoing support and cooperation of our Choose Chicago team and here’s to you and Chicago – it should never grow old being number one. Congratulations to the Association of Manufacturing Technology (AMT), producers of the International Manufacturing Technology Show (IMTS). AMT wrapped up an incredible, record breaking IMTS Show on September 15th, 2018. It is certainly one for the record books! 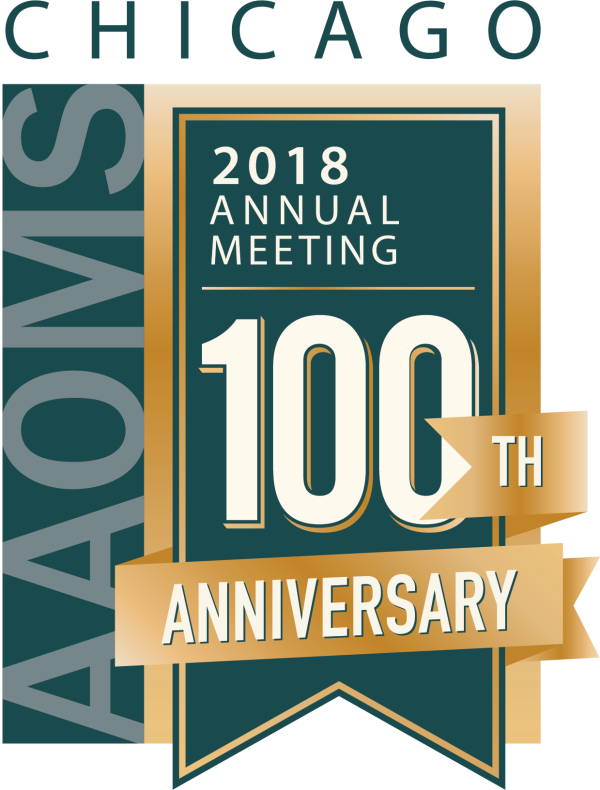 In 1918, 29 doctors got together to hold the first-ever meeting of the American Society of Exodontists – the organization that later evolved into AAOMS. One hundred years later, thousands of attendees will gather to commemorate the past and explore new applications to achieve greater patient care and surgical outcomes while heightening the specialty’s reputation and solidifying its future. The AAOMS Annual Meeting will take place at McCormick Place West October 8 – 13, 2018. AAOMS is a home-town client. Choose Chicago congratulates AAOMS on their 100th Anniversary. Welcome home AAOMS! 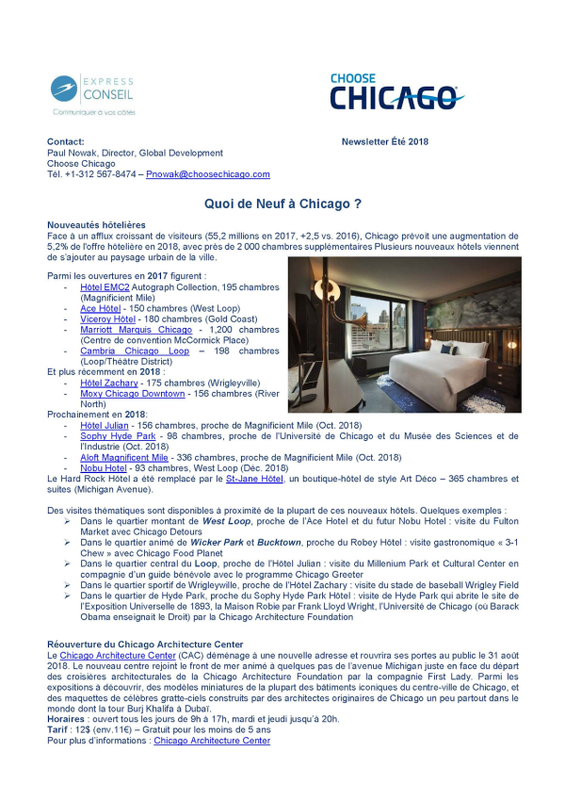 Choose Chicago helped craft August’s addition of a French Travel Trade Newsletter distributed by Express Conseil. Its purpose was to introduce French Tour Operators and Travel Agencies to various tourism products available in Chicago. This newsletter was in the form of an E-blast and sent to 1,342 of their subscribers. 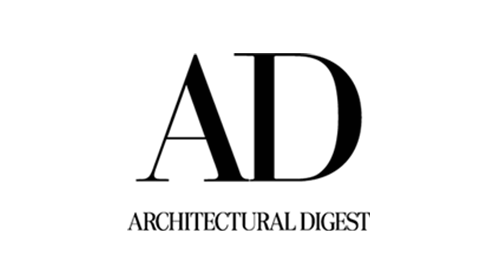 Highlighted in this newsletter were new Chicago hotels, Chicago Architecture Center, Chicago Gourmet, EXPO Chicago, Art on theMART, rooftop bars, and Chicago sporting events. 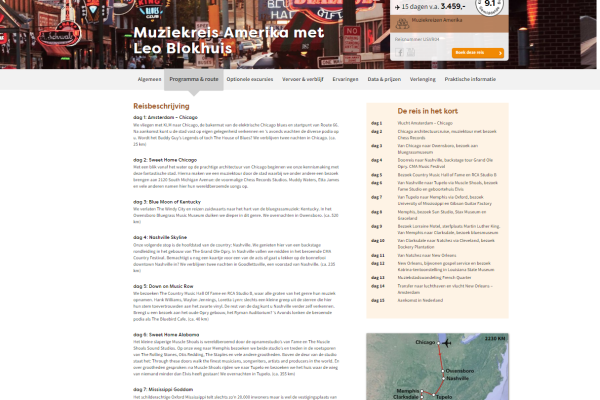 AmericaBound Tours, operating in the Netherlands, provided a marketing contribution to promote their “Sounds of the South Music Tour Series”. Chicago was featured in Volkskrant Daily & Soundz magazine to promote this tour, and received social media marketing to promote the itinerary. 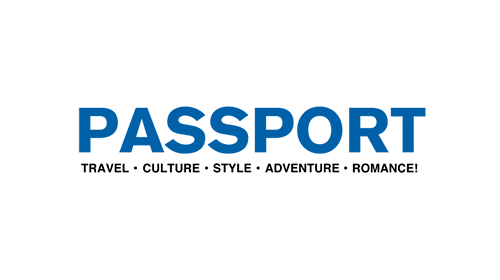 The two outlets have a combined readership of 765,000. 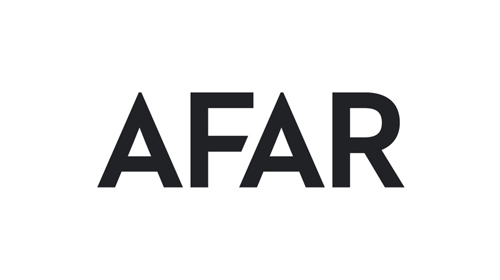 The Tour actualized in June 2018 with 48 room nights sold (Fairfield Inn & Suites) and generated $12,500 in new hotel revenue. Additionally, 36 Shoreline Sightseeing attraction cruise tickets sold. This promotion provided a great opportunity to help support Brand USA’s focus on music in America, in support of their IMAX film America’s Musical Journey released this year. 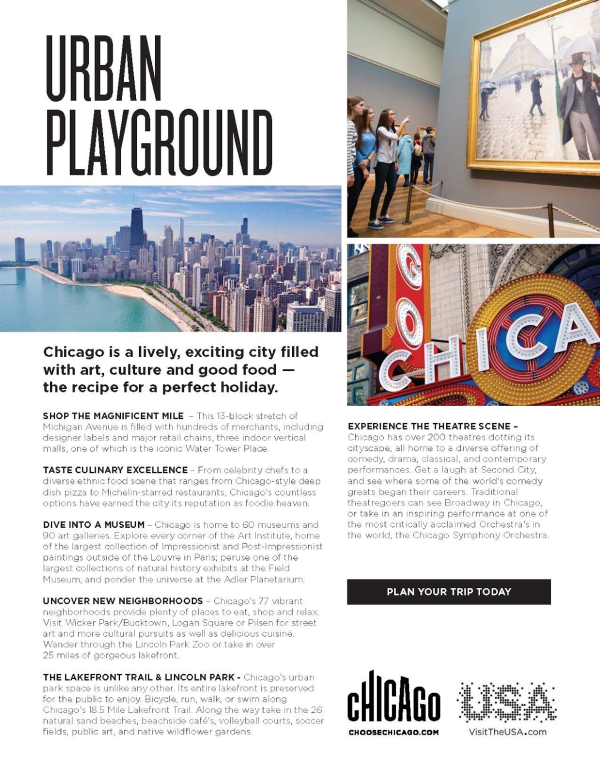 To raise awareness for Chicago as a leisure destination city to the European Travel Trade, Choose Chicago partnered with Brand USA for a 1-page Chicago ad in New World Travel’s 2018 Trade Tariff. Germany, Austria, France, & Switzerland were the targeted countries. The Trade Tariff was distributed to over 5,000 Travel Trade Professionals, all B2B. This Receptive Tour Operator’s annual number of room nights booked in Chicago is 2,377 with $447,801 in revenue. 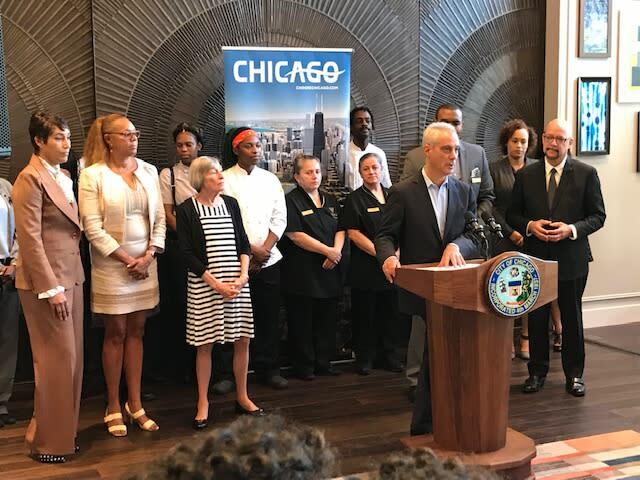 WELCOME THE NEWEST CHOOSE CHICAGO PARTNERS FOR SEPTEMBER 2018! Live music featuring the Anthony Robinson Band plus food & beverage. Don’t delay! The deadline to register to participate in Chicago Restaurant Week is October 31, 2018. 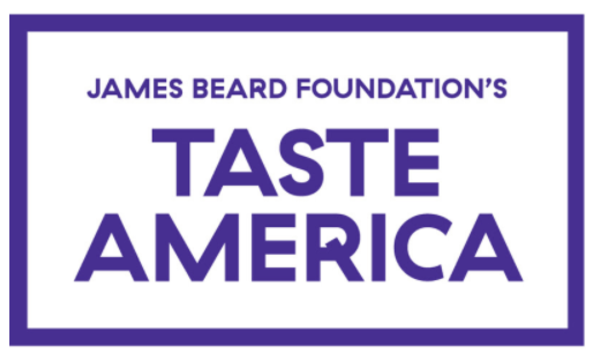 Choose Chicago dining partners have the opportunity to participate in one of the most highly anticipated culinary events of the year. Last year’s record-breaking Restaurant Week featured 365 restaurants, serving 639,600+ diners and generating over $29M in direct spending at Chicago area restaurants during a traditionally slow time of year. These prices exclude tax, tip and beverages. 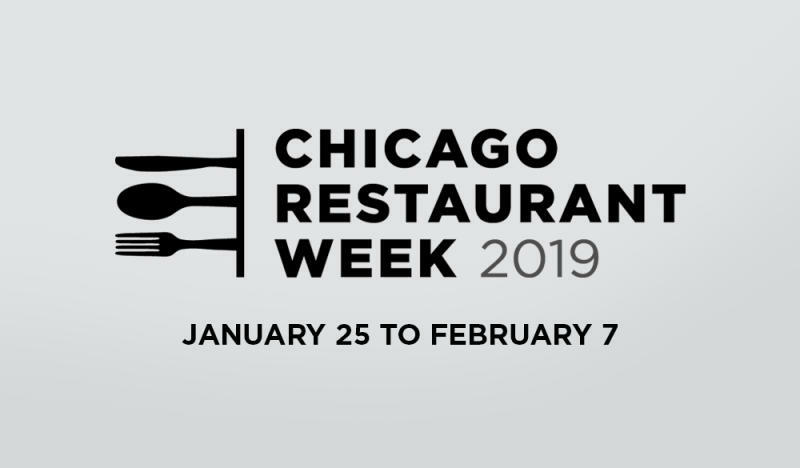 If you have questions please contact us at restaurantweek@choosechicago.com. Seven years ago a new catering experience began in Chicago and has been thriving ever since. A profile of The Paramount Group, a family owned and operated business, located at 1750 W. Lake St.
Chicago – Chicago Theatre Week (#CTW19), an annual celebration of the rich tradition of theatre-going in Chicago during which visitors and residents can access value-priced tickets, will take place February 7-17, 2019. From joy to heartache and every feeling in between, Chicago theatre tells stories that evoke big emotions. Stories that take risks, inspire awe, ask tough questions – and dare audiences to do the same. From musicals to plays to comedy, theatre is for everyone in Chicago. Chicago Theatre Week is a celebration of the stories we share and will kick off 2019 as the Year of Chicago Theatre, a first-of-its-kind initiative designated by Mayor Rahm Emanuel. Chicago Theatre Week, spanning a week and two full weekends, is heading into its seventh year. As a program of the League of Chicago Theatres, in partnership with Choose Chicago, over 100 theatre productions are expected to participate in neighborhoods throughout the city and suburbs. The value-priced CTW tickets will be $30, $15, or less. Tickets will go on sale and a list of participating productions will be available online at 10:00am CST on Tuesday, January 8 at ChicagoTheatreWeek.com. A small sample of the many productions expected to participate are: Court Theatre – Photograph 51; Drury Lane Theatre – Mamma Mia! ; Goodman Theatre – How to Catch Creation, Twilight Bowl; Lookingglass Theatre – Act(s) of God; Northlight Theatre – Nina Simone: Four Women; Paramount Theatre – The Producers; Porchlight Music Theatre – A Gentleman’s Guide to Love & Murder; The Second City – 107th Mainstage Revue; Steppenwolf Theatre – A Doll’s House, Part 2; TimeLine Theatre – Cardboard Piano; Victory Gardens Theater – Pipeline; and Writers Theatre – Ma Rainey’s Black Bottom. Chicago Theatre Week is presented by the League of Chicago Theatres in partnership with Choose Chicago. Subscribe to the Theatre Week email newsletter or follow @ChicagoPlays on Twitter for updates and announcements. A year ago this past May Mayor Rahm Emanuel announced a new kind of summer festival - Chicago Friday Night Flights - a series of neighborhood events highlighting Chicago’s thriving craft beer scene. The second season of Chicago Friday Night Flights ended just like the first – as a resounding success. Attendance across all six Friday Night Flights events this summer reached over 3,500 people. The 2018 edition of “Flights” started in June with a large kickoff event at Gallagher Way and closed last month with a season-ending party on the Chicago Riverwalk. This year’s Gallagher Way event was followed by five outdoor neighborhood parties - three street festival-type events a beach party and a concluding celebration on the Chicago Riverwalk. Milwaukee Avenue Corridor, 31st Street Beach, the Ravenswood neighborhood, the West Loop and the Riverwalk all played host to this unique summer celebration. The 2018 “Flights” series featured 81 breweries. Each event included local entertainment and tasting passes for food and the opportunity to sample various beers from the participating breweries. Produced by the Illinois Craft Brewers Guild and Choose Chicago, the festivals showcased neighborhood breweries and celebrated Chicago’s beer scene, which has become an epicenter of the global craft beer movement. Chicago’s neighborhoods are home to 65 breweries featuring some of the nation’s best award-winning beers, creating a diverse array of styles. The James Beard Foundation celebrates women shaking up Chicago’s beverage scene! September 21-23, Chicago hosted the first Laver Cup ever held outside Europe to great success. Team Europe defeated Team World 13-8, successfully defending the Laver Cup following an action-packed three days of stunning tennis at the United Center. The second edition of the Laver Cup recorded a total attendance of 93,584 over three days. More than 72,000 fans visited the elaborate Laver Cup Fan Zone - complete with a spectacular glass-enclosed practice court fans could walk through while players were warming up. The Laver Cup was broadcast in 200+ countries , and gained over 55M impressions on social media. Thank you to the Laver Cup, Team8, Tennis Australia, the USTA, our partners at the United Center and all those involved in putting on this spectacular event. We’re looking forward to sharing more with you in the coming months on the true impact the Laver Cup had in Chicago. In the meantime, don’t forget to get your tickets to The Rugby Weekend coming up November 3! 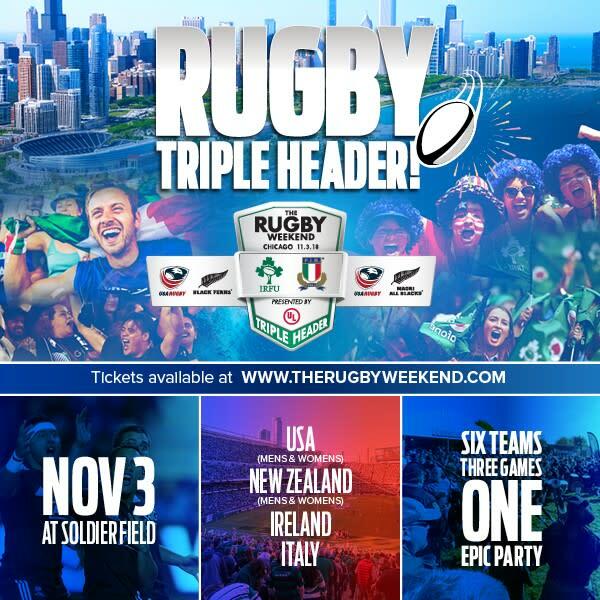 One Day, Three Matches, One Ticket: Rugby Weekend Tripleheader, Nov 3! One ticket covers all three of these highly anticipated international rugby matches, with tickets starting at $40. As an exclusive offer to our Chicago sports fans, use code CHICAGO to get 25% off tickets – hurry, this offer is only available for a limited time! 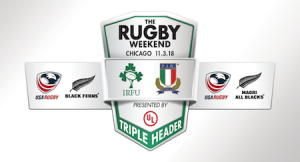 The Rugby Weekend is returning to Chicago November 3rd!